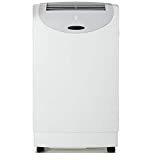 Friedrich - PH14B : Portable Air Conditioner Review • The Air Geeks, reviews of air conditioners, dehumidifiers and air purifiers. The PH14B is a 4-in-1 portable air conditioner that offers impressive cooling and heating capacities. Its high heating and cooling capacities make it a suitable option for medium and large rooms. 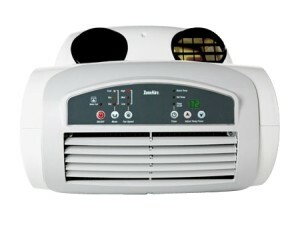 This portable air conditioner is based on a dual hose design and offers an impressive performance. Furthermore, this unit is specially designed to allow you to regulate the environment of your room with ease and convenience. Are you looking for a strong air conditioner for your room? If that is what you are looking for, then this air conditioner is a suitable option for you. To help you make a wise decision, we have compiled all the information that you need about this system. Do you want to know if it consumes excess power? Or are you interested in knowing its weaknesses? We have researched widely to provide you with reliable answers to all your questions. Without further ado, we will start with its features. The Friedrich PH14B is a strong AC that serves as an air conditioner, dehumidifier, heater, and a fan. This multi-function unit offers an impressive cooling capacity of 13500 BTU. Its high capacity makes it a suitable choice for medium and large rooms. The manufacturer recommends a 700 square feet space but we have observed that the unit delivers better performance when it is used in smaller rooms. In case you live in a place that experiences weather fluctuations, then you need a unit that serves many purposes. To ensure that you don’t require a separate heating unit during cold seasons, this air conditioner features an inbuilt heater that offers a heating capacity of 10700 BTU. Are you struggling to control the relative humidity of your room? Apart from cooling and heating, this unit also offers a built-in dehumidifier that removes excess moisture to ensure that your room has the desired relative humidity. Are you looking for an air conditioner that cools the room within a short time? If that is what you are looking for, then you need a dual hose system. The PH14B, due to its dual hose design, allows a closed loop cooling process thus providing faster cooling as compared to single hose systems. To prevent water spillages, the PH14B shuts off automatically when the reservoir is full. You therefore don’t need to worry that the unit will flood your house in your absence. In addition, this unit features a 24-hr on/off timer and comes with a remote control. Its timer allows you to program the activation and deactivation times. Furthermore, this portable air conditioner offers three cooling speeds and three fan-only speeds. The PH14B employs a self-evaporative mechanism to minimize the need for manual draining of the accumulated water. This highly effective mechanism also helps to minimize shut-offs that are caused by filling the reservoir. You therefore don’t need to empty the bucket from time to time. In addition, this unit features castor wheels that allow you to move it from one room to another with ease. How does your window slide? Although this air conditioner fits in most standard windows, we have noted that it is unsuitable for horizontally sliding windows. For most vertical windows, the kit fits without any problem. In case you have a non-standard vertically sliding window, then you may need to do minor modifications for the kit to fit perfectly. It is multi-functional. This unit can be used for various environment control needs. It cools, heats, circulates air, and dehumidifies. Strong and fast. Apart from serving many purposes, this dual hose unit cools the house within a short time. Energy efficient. Although this unit delivers impressive performance, it consumes minimum power. It is therefore a suitable option for people who want to save money. Non-intuitive user interface. Although this unit offers impressive features, we have observed that it has an interface that is not user friendly. Overestimated recommended size. From our research, we noted that the manufacturer overestimated the maximum area. Relatively loud. Its compressor produces a loud sound. This is a portable A/C-Dehumidifier-Heater unit. The description says 13,500 BTU. The box it came in says 14,000 BTU in cooling and 11,000 BTU in heating. It has the much needed double vents so that both air in and air out come from outside. Units that do not have two vents pull hot humid air in through your home's walls causing a lose in efficiency. The ducting and window inserts are sound. They are not airtight, but that can be fixed with insulation foam. The unit itself has a digital thermostat that is controlled by the display and buttons on top of the unit or by the included remote. All parts feel solid and high quality. So far it is doing a nice job of keeping my entire 800 sq ft condo at around 77 degrees despite Houston, TX heat and humidity. I will update when I test out its heating capability." I'm giving this 4 stars because I'm not impressed with the amount of heat it produces when in that mode. That said, the air conditioning part is the BEST! Once you figure out its thermostat is about 5 degrees above the real temperature in the room, it cools my 20' x 20' bedroom in less than 5 minutes. Waiting for the next electric bill, but I don't think this uses that many kilowatts. Actually, I really don't care - being cool in this add-on room is worth any price. Now if only the heater worked better...I'll stick to my present heater that does the job and is inexpensive to run." The PH14B is a strong air conditioner that offers many features. This multi-functional unit is suitable for cooling, heating, dehumidifying and circulating air in your room. In case you live in a place that experiences weather fluctuations, then this is a suitable choice for your cooling needs. Despite the impressive features offered by this air conditioner, we have observed that it has its downside. To start with, its interface is not user friendly. It is therefore not easy to set the unit. Secondly, our research revealed that this air conditioner is noisier than most units of same capacity. It may therefore not be a suitable solution for quiet places. If these cons are not a big problem to you, then you can proceed and buy the PH14B, by Friedrich. For us at the Air Geeks, our enthusiasm is only moderate.